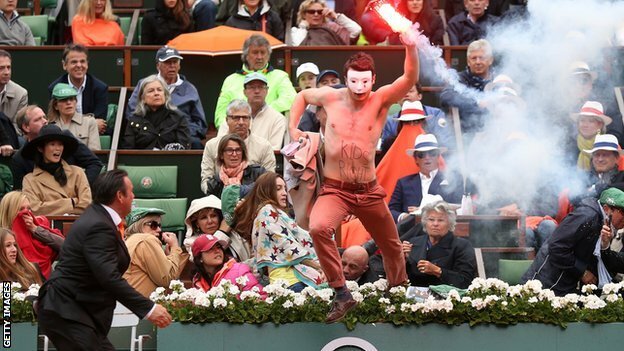 A masked protester waving a lit flare ran onto the court at the men’s final of the French Open tennis in Paris but was restrained by security before he could interrupt the match. A few minutes earlier, two bare-chested men stood up in the front rows, holding a banner accusing France of trampling on children’s rights. Other protesters called on President Francois Hollande to resign. The protesters were angered by France’s decision to legalize same-s** marriage. The first same-s** wedding in France took place last month under tight security. Campaigners against gay marriage and adoption by same-s** couples, backed by the Catholic Church and conservative opposition, argue the law undermines an essential building block of society. The protests at the French Open final were quickly snuffed out. Rafael Nadal won the final in straight sets, defeating fellow Spaniard David Ferrer 6-3, 6-2, 6-3.